The first Grammy Awards were held in 1959 in the Grand Ballroom of the Beverley Hills Hotel, and ever since, the ceremony has been garnering the attention of music lovers across the United States and abroad. The 54th edition of the awards, held in 2012, was watched by around 39 million people across the United States and the event was even broadcasted live around the world. The most recent ceremony in 2019 saw a continued decline in viewership numbers, with less than 18 million people tuning in to watch the event. This figure marked the lowest number of viewers since the 2008, when only 17.18 million people tuned in. Much has changed since the Grammys first began in 1959. 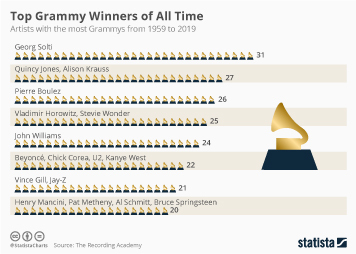 As of 2019, Grammys are awarded in 84 separate categories, compared to just 28 in the ceremony’s inaugural event. Also drastically different from when it first began; the ceremony generated nearly 100 million dollars in advertising revenue at the most recent edition. Although much has changed throughout the years, some faces and names have become essentially permanent fixtures of the event: Quincy Jones has received a total 80 nominations spanning the course of 4 decades, and Hungarian composer Georg Solti accumulated his record 31 Grammy wins over the course of over 30 years between 1963 and 1998. Possibly the biggest single award given each year is the Album of the Year, which recognizes not just the artist, but the producers, and engineers as well. How to Dismantle a Bomb by U2 and Supernatural by Santana are the most widely acclaimed albums of the Grammy era, each earning 9 total awards, tying them for most awards ever won by a single album. In addition to its obvious appeal as a ceremony dedicated to celebrating great music and musicians, the Grammy Awards have also become an opportunity for fans to learn more about their favorite entertainers and see them in an unfamiliar environment. Around 26 percent of all viewers at least sometimes tune in for the red carpet coverage of the event, and around 11 percent of viewers state that they tune in more for the red carpet coverage than for the awards themselves. With many musicians earning tens of millions of dollars every year, it is no wonder that fans are eager to see more of their favorite performers away from the stage. One issue that many of these celebrities and their fans alike have been calling attention to in recent years is the lack of gender diversity in the awards. In 2018 only 8 percent of the nominees were female, and award categories like Record of the Year, Album of the Year, and Song of the year are traditionally dominated by male performers. The Grammy Awards remain one of the most sought-after and well-known awards ceremonies in the world, but the organizers must focus on fixing the obvious issues with the awards or risk continuing the downward trend in viewership numbers and popularity. Topic: Music industry in the U.S.